Status: Rare casual fall and spring migrant statewide. Rare casual winter visitor east. Rare casual summer visitor statewide. Documentation: Specimen: UNK un-numbered, 20 Oct 1912 Kearney, Buffalo Co.
Taxonomy: No subspecies are recognized. See Mallard for hybridization with that species and a discussion of “Mallard” taxonomy. American Black Ducks seen in Nebraska should be carefully examined for evidence of increasing hybridization. A presumed hybrid was at Branched Oak Lake, Lancaster Co 14 Feb 1999 and a few female-type birds at Carter Lake, Douglas Co during winter 2013-2014 had greenish tinges to their crowns. The male of a pair in Sarpy Co 22-23 Mar 2014 had greenish feathering on its head, likely a hybrid. Two hybrids were reported in spring 2016: one at Lake McConaughy, Keith Co 2 Jan, and another in Platte Co 7 Jan, the latter a dark bird but with brownish coloration in its breast. A photograph of a bird in flight in Dodge Co 19 Mar 2018 (Croshaw, https://ebird.org/view/checklist/S43788059) suggested mixed parentage. Changes since 2000: As discussed under Taxonomy (above), the frequency of hybrids and introgressants with Mallard is increasing; careful observation of female-type birds should result in detection of more such hybrids in Nebraska. 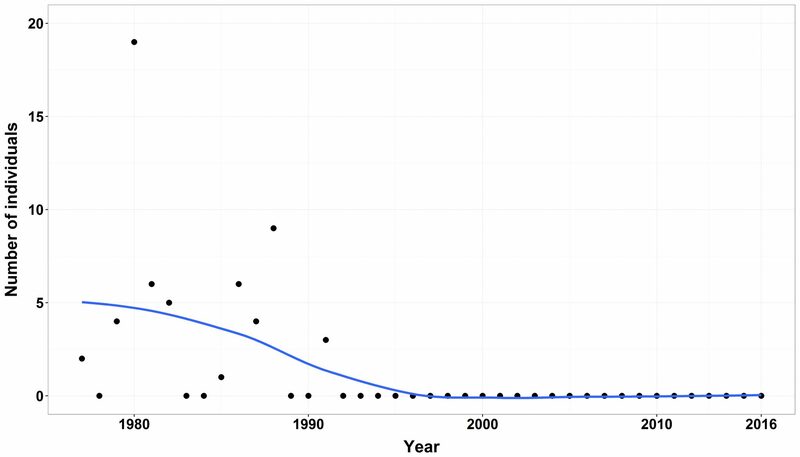 There was a >50% decline in overall numbers of this species in North America between the 1950s and 1980s, and subsequent conservation efforts have had little impact due to the lack of habitat or behavioral differences between this species and Mallard (Baldassarre 2014). This species was rare but regular, especially along the Missouri River valley as a migrant and winter visitor as recently as the 1980s (See Figure 1, Appendix). There are several earlier midwinter reports (see Winter). Later reports are: 11 Apr 1989 Cedar Co, 19 Apr 2003 Sherman Co Reservoir, Sherman Co, 25 Apr Oshkosh, Garden Co (HMM 3076), 6 May 1930 Antioch, (Rosche 1982), 12 May 1958 Douglas Co, and 12 May 1991 Sarpy Co. A female (greenish bill) was reported as an American Black Duck at Jack Sinn WMA, Saunders Co 31 May 2016; it was studied at a distance but had a “dark blue-purple speculum with no white edging”, thus possibly a Mottled Duck. There are few reports west of Hall Co: 14 Mar 1949 Chadron, Dawes Co (Rosche 1982), Apr 1925 Oshkosh, Garden Co (HMM 3076), and 6 May 1930 Antioch, Sheridan Co (Rosche 1982). During Zeillemaker’s five-year tenure (1978-82) at Crescent Lake NWR, Garden Co and North Platte NWR, Scotts Bluff Co, he recorded no American Black Ducks (Roger Sharpe, personal communication). Almost all reports during migration are of individuals in Mallard flocks. The few summer reports are in the period 7 Jun-22 Aug. Although it is likely that some summer reports of American Black Duck may result from the difficulty of identifying this species compared with the rather dark-plumaged Gulf Coast Mottled Duck (A. fulvigula maculosa), there is some westward molt migration of American Black Ducks in late May and early Jun by males, usually to Manitoba and Saskatchewan (Baldassare 2014), which might be a source for a few summer vagrants in Nebraska. An intriguing source of summer birds, especially near population centers, may be released Easter ducklings (Cortelyou 1975). There are these earlier reports: a Sep 1906 specimen HMM 1960 taken at Funk WPA, Phelps Co (Swenk, Notes Before 1925), a Sep 1910 specimen taken at Sutton, Clay Co (Swenk, Notes Before 1925), and three undocumented reports 13-15 Sep 1977 Garden Co, 9 Oct 1999 Brown Co, and 10 Oct 1986 Platte Co. Later reports are of presumed wintering birds. Panhandle reports are few: 29 Dec 1962 Scottsbluff CBC, 13-15 Sep 1977 Garden Co, and 29 Oct 1976 Box Butte Res, Dawes Co (Rosche 1982). Westerly were one taken on the Dismal River in Thomas Co 10 Nov 1906 (HMM 2562), another shot near North Platte, Lincoln Co in fall 1923 (Tout 1947), and one flying with Mallards in Keith Co 2 Dec 2010. As in spring, individuals and occasionally small groups arrive with Mallards in late fall and may remain into winter. Winter: Midwinter reports, all from Boone and Clay Cos eastward, are: three wintering at Branched Oak Lake, Lancaster Co, 9 Jan 2006 Harvard WPA, Clay Co, 9 Jan-23 Feb 2014 Carter Lake, Douglas Co (Brogie 2015), 10 Jan 1989 Cedar Co, 12 Jan 1985 Lancaster Co, 16 Jan 2011 Sarpy Co, 16 and 22 Jan Cass Co, 17 Jan 1986 Douglas-Sarpy Cos, 18 Jan 1983 Douglas-Sarpy Cos, 18 Jan 1986 Dakota Co, 19 Jan 2013 Cass Co, 20 Jan 1980 Washington Co, 20 Jan 1989 Boone Co, 22 Jan 2011 Omaha, Douglas Co, 30 Jan 1983 Lancaster Co, 3 Feb 1979 DeSoto NWR, Washington Co, and 1-2 on 6-13 Feb 1999 at Branched Oak Lake. Photograph (top) of an American Black Duck with female Mallard at Fontenelle Forest, Sarpy Co, 20 Nov 2013 by Phil Swanson. Figure 1. Number of American Black Ducks recorded during the Desoto Christmas Bird Count (CBC) 1977-2016. The graphic shows the species was regularly observed in the late 1970s and 1980s, but has not been recorded since 1991. Points represent actual counts and trend line created using locally weighted scatterplot smoothing (LOESS) in R Studio (2015). Hyland, J.M. 1968. Black Duck. NBR 36: 81. RStudio, Inc. 2015. RStudio: integrated development for R. RStudio, Inc., Boston, Massachusetts. http://www.rstudio.com/, accessed 1 December 2016.